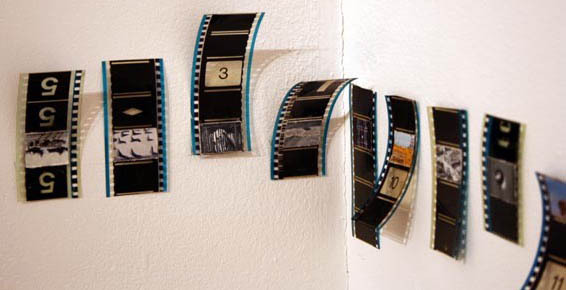 For Sluice Art Fair Transition is showing Strip, an exhibition made up of groups of specially selected 2D works by 20 artists presented with a distinct nod towards the filmstrip. All of the artists featured in Strip employ a sequential approach to their varying subject matter. But although each ‘strip’ is composed of works made in a series, adjoining frames do not necessarily correspond to each other. There are in fact no traditional narrative structures; instead it is for the viewer to create their own connectivity. In her essay for the Transition publication About Painting Alli Sharma identifies the ‘importance of a process to picture making, rather than simply an end result’. Forsaking the idea of the grand gesture, the Strip artists are dissatisfied with the stand alone masterwork, the single dumb painting made to hang on some ever decreasing rich patron's wall. Furthermore with the huge abundance of easily available digital imagery there is just so much more to paint and draw and not enough time to spend labouring on one image. The Strip artists are restless and resourceful, with their minds jump cutting from one thing to another. It is the actuality of the process which is the receptacle that holds and binds these multi-faceted back-stories together. In Mark Cousin’s The Story of Film: An Odyssey film is described as ‘an image bank to flick back and forth to in our imaginations’ and it is this metaphor of a ‘clicking machine’ that mirrors the work on show in Strip.